Danyelle Khmara Canvassers prepare to hit the streets for No on Prop 305. 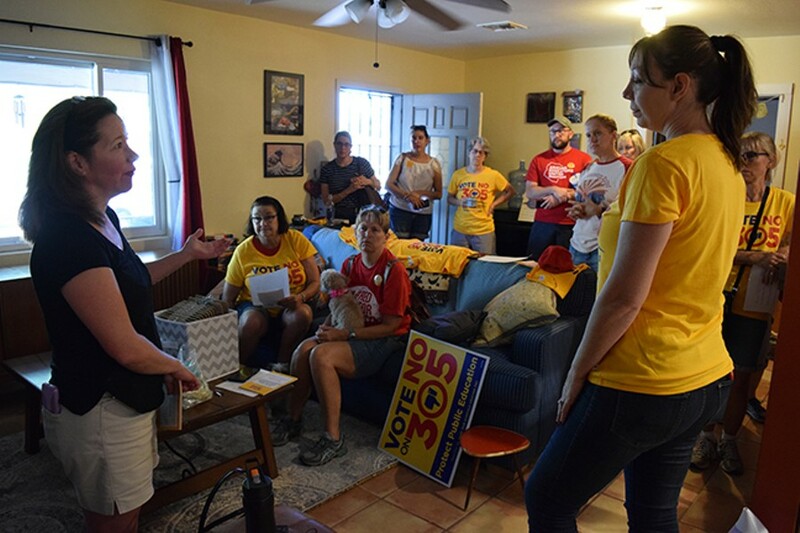 Canvassers switched red shirts for yellow ones before hitting the streets to knock on doors. The group of mostly teachers and parents, part of this year's #RedforEd movement, donned the yellow "No on Prop 305" shirts to continue the fight over education funding. "Seeing a bill come through that would take millions of dollars out of our public school system is not the direction we want to go," said Nikki Lee, a mother of three public-school students and volunteer with Save Our Schools, a statewide grassroots group advocating for public education. Prop 305 would expand the Empowerment Scholarship Account program, referred to colloquially as school vouchers. The ESA program started in 2011 to provide educational options other than public school for children with disabilities. Taxpayer dollars that would have otherwise been spent on a public school was provided instead to parents to cover tuition and costs for private, parochial or home school supplies and/or tuition. A later expansion included students attending failing schools or districts, in foster care, in military families, residing on an Indian Reservation or siblings of current or previous ESA recipients. Passing Prop 305 would increase the expansion further, making about 30,000 scholarships available by 2023 and practically all families with school-age children eligible to apply—increasing the pot of money siphoned from the public school system. In April 2017, the Arizona Legislature passed the ESA expansion and Ducey signed it into law. The leaders of SOS collected enough signatures to get a referendum on the ballot for voter approval of the law, stalling the expansion. Save Our Schools co-founder Dawn Penich-Thacker says if just six students leave a school, the money that leaves is the equivalent of a teacher's salary, which could lead to massive layoffs. "Our public schools are already starving," she said. In fiscal year 2017, the Arizona Department of Education estimated 3,100 student were enrolled in the ESA program, although the current cap is at about 5,500 students annually through 2019. About $46 million went into the program in fiscal year 2017, according to the Department of Education. Rep. Mark Finchem (R-LD11) voted for the expansion when it was in the state House. He says that public education should be about educating children with public funds, not supporting a "one-size-fits-all" public school system. The way he sees it, the public schools are inadequate, and students are not learning what they need to be an informed electorate. "The charters and private schools—it's a fundamentally different response: When you ask kids simple questions about the three branches of government, they know," he said. "They know about the origins of the Constitution. They know the difference between Democracy and Republic. So if they're not learning that in a public school system...we've got lots of options out there." Taking more of a free-market approach, Finchem says that private schools offer a better education because they are more concerned with delivering a higher quality product to appeal to families. Because public schools get funding regardless, they do not have an incentive to perform as well. He said his constituents with school-age children tell him they're not happy with the public school system and the ESA expansion would "empower parents to make a choice that is right for their child." "If the public school system feels threatened by that, they need to up their game," he said. Finchem also doesn't think that the public schools will be drastically affected, pointing out that the number of people currently using the ESAs hasn't reached the existing cap. He said if enough students were to leave certain public schools, some schools may have to close and the students can be consolidated into the remaining schools. Finchem said the times are changing and education should be able to as well. "You have to be able to free yourself from models that have been around since the early 1900s," he said. Rep. Todd Clodfelter (R-LD10), one of four Republicans who voted against the expansion in 2017, said he's worried it would deplete the general fund of money for public schools. Like Finchem, Clodfelter agrees the public school system isn't great but he argues it can't just be abandoned for something new. "Taking money out of the public pool that we all agreed on just doesn't sit right with me," he said. Ultimately, he said he voted against the expansion and is against 305 because his constituents are against it. Clodfelter is also concerned oversight of ESA funds isn't clear in the bill, and that if the expansion becomes a voter-approved law, it would be very hard for the Legislature to make any changes in the future. He also said an expanded pool could make it harder for kids with disabilities to access the ESAs. Penich-Thacker, from Save Our Schools, says this is a concern for parents of children with special needs who she talks to and who volunteer with Save Our Schools. On this point, Rep. Finchem says the students with special needs will still have priority because that's the way the current law was written. But nowhere in the expansion bill, which would become law with the passage of 305, does it give priority to children with special needs or any other category of student.